I don't have many ready yet, but here's two that I pulled out from the bunch I took on the last evening. I really liked how these came out. I'll work on getting the rest of the photos from the honeymoon put into some sort of collection that people can look at. Might take me a while, but I'll keep people posted. Today I did something I never thought I'd ever do. (And I put it off for our last day in case I failed, so it wouldn't bring down the rest of the trip.) I went snorkeling. But not just off shore. We took a boat several miles off-shore to Molokini. Then I jumped in the ocean in some 30 foot deep water, no flotation gear... and did it. But I did it. We did it. And it was amazing. The visibility was... well, the guy said it was 150 feet plus. The water was choppy as hell, but when you're staring down it doesn't really matter. The fish were really damn close, some of them would swim within a foot of your face if you were very still. Oh yeah, and watching the waves push the fish (and you) around was pretty awesome. The coral was pretty damn neat too. Then the boat took us over to another spot, which wasn't near some little island, and we looked for turtles. We saw a few! But the water was much more cloudy over at this point (due to a "south swell" apparently), and it was hard to see things. This time I opted for one of the flotation belts, to see what it was like. Turns out it's much nicer with the belt: although I admit that might be a mental thing. Anyway, I felt I had to write about this, because it's fresh in my mind. I almost didn't book a trip like this because, honestly, I'm pretty damn afraid of water, of the ocean. And the thought of jumping in to water that is way, way over my head just... well, thankfully I'm pretty good at handling my panic response (even if it does take a forced mental reboot... not sure how else to describe it). In the end I really enjoyed it. Would have been better in calmer water, or if we had some more time, but yeah. Awesome. 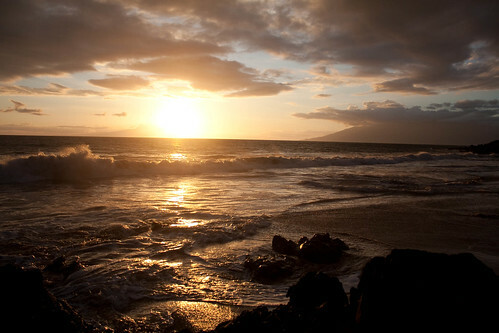 I think I'm going to go wake Janine up now and take her down to the beach for sunset. 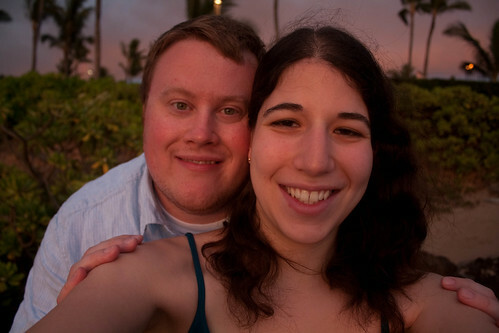 One last sunset together (on Maui).